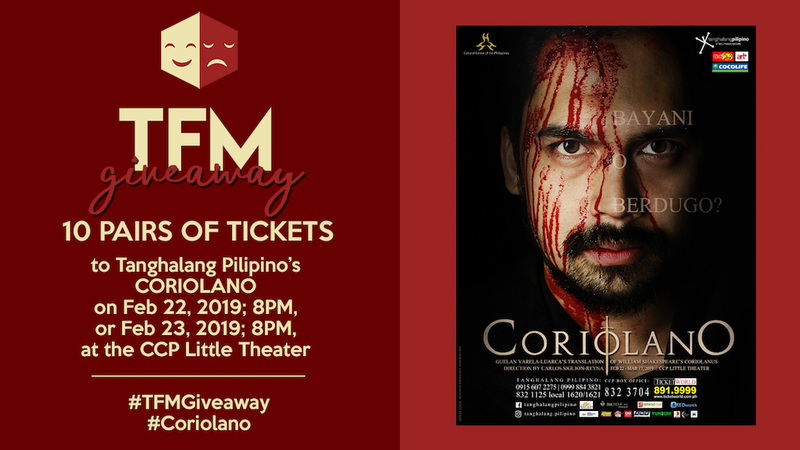 Win tickets to "Coriolano" by Tanghalang Pilipino! Tanghalang Pilipino will be staging “Coriolano”, a Filipino adaptation of Shakespeare’s “Coriolanus,” at the CCP Little Theater. It will be running from February 22 to March 16 and we’re giving away a total of 10 PAIRS OF TICKETS to 10 LUCKY WINNERS. 5 PAIRS EACH will be given away for the 8pm shows of February 22 and February 23. 2. Share this post on your Facebook wall and tag the person you want to take to the show. In the post, tell us why you want to watch “Coriolano”. 3. Don’t forget to set​ ​your​ ​post​ ​to​ ​public​ (so we can see them! ), tag us, Tanghalang Pilipino, and include these hashtags: #TFMGiveaway, #Coriolano. You can submit​ ​your​ ​entries​ ​until​ February 17, 8pm​. Team TFM will be choosing the winners and we’ll announce the lucky theater fans on February 17, 9pm on our Facebook page. Break a leg! Previous Sing Andrew Lloyd Webber Hits in the next Broadway Open Mic!